COULD YOU LOVE A LACETTI? The Lacetti was the first new car produced by Daewoo under the stewardship of General Motors but it arrived too late to save the ailing Korean marque. Don't let that put you off, though. GM rebadged the Lacetti as a Chevrolet and, in so doing, gave it a second chance at success. With neat, well-resolved styling and a simple value proposition, the Lacetti has quietly done very well. 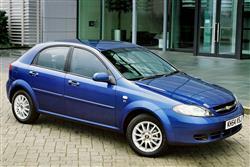 Picking up a low mileage used example is a great way to land a modern hatch for a lot less than you may have expected. A lot was riding on the Lacetti when Daewoo started the planning process. The company had just emerged from a troublesome period and the benefits of General Motors' investment, know-how and marketing muscle were starting to bear fruit. Lacking a credible contender for some time, it was vitally important for Daewoo to establish a meaningful presence in the family hatch sector and the Lacetti was earmarked as the model to do it. By the time the car hit the showrooms in March 2004, however, Daewoo's problems were deemed unrecoverable and by October of the same year, it had been announced that the Daewoo products would be rebadged Chevrolet from the start of 2005. So it was that the Lacetti entered into a new existence less than a year after it was originally launched. As well as the hatch versions, GM decided that the Nubira saloon would also wear a 'Lacetti' badge, creating a wider Chevrolet Lacetti range. A Sportwagon estate version was also introduced and the line-up was further supplemented by the arrival of a 1.8-litre petrol engine that powered the good-looking Lacetti Sport. Styled by Italdesign, the Lacetti certainly doesn't smack of something bargain basement. Daewoo forged quite a relationship with this design house, having been extremely happy with the styling work performed on the Matiz citycar and the Kalos supermini - cars which also took on Chevrolet badging. The Lacetti's shape is well resolved; a purposeful wedge with strong shoulders and a very pert rump. The wheel at each corner look not only gives a dynamic stance but also maximises internal space. Break out the tape measure and you'll find that the Lacetti's wheelbase is a full 2600mm long, longer than cars like the Alfa 156 and the Audi A3. Given that most models in the Mondeo class campaign with a wheelbase of around 2,670mm, you'll appreciate that the Lacetti offers a surprising amount of room for a 'compact' car. With 932mm of rear legroom and 275 litres of boot volume, you'll not feel claustrophobic in the back of a Lacetti. Fold the rear bench down, keep a keen eye open for animal welfare types and you'll be able to swing a generously sized cat in the 1,045 litres of fresh air at your disposal. The rear light clusters are an interesting design feature, bisected as they are by the shutline of the hatchback, and the stub tail and roofline of the car look very much like a Vauxhall Astra -which may be something less than a coincidence. The almond-shaped clear glass headlamps and well-defined wheel arches are signature post millennial design features and the Lacetti looks the part even in traditionally frumpy five-door guise. A three-door model was never offered which is something of a shame, as this would have been quite a looker. To date no significant faults have been noticed with the Lacetti. In order to get the best from the warranty package, check to ensure that servicing has been carried out at the specified intervals. Good showings in the JD Power customer satisfaction survey bode well for used buyers. (approx based on a Lacetti 1.6 SX) Parts are a little pricier than from mainstream manufacturers but given that Chevrolet is part of General Motors, you should expect to see affordable spares prices. A clutch assembly will be around £70 and an air filter should be close to £8. Brake pads are around £17 a front set with a cam belt relieving you of £30. Chevrolet, by and large, did their homework well. The company claimed that almost two-thirds of all petrol engines in this segment, for example, have a capacity of between 1.4 and 1.8 litres, so the three power units available for the Lacetti would seem to fit this bill very well. There are, however, lies, damned lies and statistics. The 1.4, 1.6 and 1.8-litre engines with which Chevrolet went to battle in this segment had an Achilles heel. They all drink from the green pump. Those statistics quoted take into account diesel cars too, which represent a growing proportion of UK new car registrations and without a diesel to campaign with, the Lacetti found itself at a major competitive disadvantage. The engines that are available are all tried and tested twin overhead camshaft powerplants driven by a toothed belt with four-valve technology. The entry-level power train in the Lacetti 1.4 Hatch generates 92bhp and will accelerate the car through 60mph in 11.3 sec and on to a top speed of 107 mph. Overall fuel consumption is a very creditable 39.2 mpg. Next up is the 109bhp 1.6-litre unit, offered with all three bodystyles. This manages a top end of 116.2 mph and it dispatches the benchmark sprint in a sprightly 10.4 sec. With an even better fuel economy figure than the 1.4 (39.7mpg combined), the Lacetti 1.6 has a range of over 520 miles from the 13 gallon tank. The 122bhp 1.8-litre engine used in the saloon and in the Sport hatch provides some entertainment and can notch off the dash to 60mph in 9.3 seconds and will only run out of puff at a heady 121mph. Despite these eyebrow raising performance statistics, its average fuel consumption is just 37.6 mpg. As an alternative to the manual five-speed transmission, an electronically-controlled adaptive four-speed automatic transmission is available on the 1.6-litre Hatch and the 1.8-litre Saloon. If you want a new car feel and a recent number plate, the Lacetti is one of the most painless ways of getting one at distinctly used pricing. We'd opt for a 1.6-litre model, although it has to be said that it may pay to hold off for a while to net the best bargains. The 1.8-litre Sport is another worthwhile choice for those looking for a hot-hatch styling without the prohibitive insurance costs.